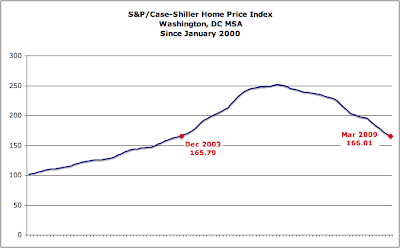 The S&P/Case-Shiller Home Price Indices report for March 2009 was released today. The report says "the U.S. National Home Price Index continues to set record declines, a trend that began in late 2007 and prevailed throughout 2008." As of March 2009, average home prices across the United States are at similar levels to what they were in the fourth quarter of 2002. From the peak in the second quarter of 2006, average home prices are down 32.2%." YoY, DC area prices fell 18.36% and, from February to March, prices declined 1.2%. Compared to previous months, the steepness of the price decline slope appears to be lessening. 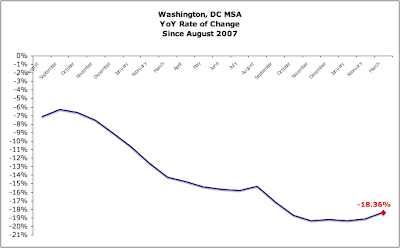 The DC area's home price index is close to that of December 2003. If you look at the tiered Case Shiller for DC, the lowest tier (under $260,065) actually showed price increases. I think its a consequence of the foreclosure moratorium (since this is February data), but it's still interesting to see the first positive number in a while. How much of this is due to price changes in outlying counties (which are included in the index? )as opposed to DC proper? In other words, have prices held more ground inside the beltway and downtown to a much greater degree than the burbs? I think it's more a matter of degree. 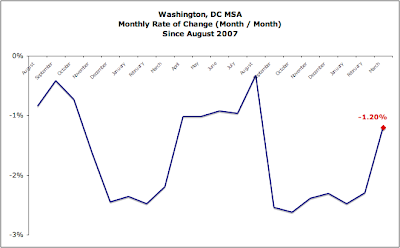 MRIS data have shown that prices in DC proper are falling, too. "In other words, have prices held more ground inside the beltway and downtown to a much greater degree than the burbs?" Anon, in a word, yes. As Keith notes, they are going down in the city and the burbs, but the difference in performance between the city & burbs is massive. Case shiller has noted as much and acknowledge its a major flaw in their methodology. As a back of the envelope calculation, it looks like the Case Shiller total price drop is about 3X the size of the actual drop in the city. I am moving out of DC all together! This city has unrealistic prices, very horrible weather and lots of crime. I am going back to southern France. Enjoy your muggy summers.